Double European champions Saracens have suffered a "confidence dip" with six weeks to turn around their season, says director of rugby Mark McCall. The 46-14 Champions Cup defeat by Clermont Auvergne was a sixth straight loss in all competitions. "We've got six weeks to see what kind of group we are, and how we respond," McCall told BBC Radio 5 live. "It is a real sign there is a confidence dip in the team and in some individuals." McCall added: "The three Premiership games we lost were close games - one point, two points, five points. But [Clermont] was different. "We are going to have to fight our way through it." McCall says the defeat by Clermont hurts his side's European campaign "a lot" and feels the period between now and January - which includes three Premiership fixtures and three games in Europe - will be decisive in saving Saracens' season. "We are going to Clermont away next up, which isn't going to be easy, and we have Leicester Tigers after that," McCall said. "But I'll judge the group, judge ourselves, judge me in six weeks' time when we have three European Cup games and three Premiership games. "Let's see how we respond as a group." Clermont's crushing display was even more impressive given the controversy and confusion ahead of the game, with players and supporters unsure about when the rearranged tie would be taking place. "It's been pretty tough," Clermont full-back Nick Abendanon told BBC 5 live. "We got told before we want to bed on Sunday the game was going to be played at two o'clock, and we woke up to find it was 5.30. "So it changed the preparation a bit. But we knew the game was going to go ahead, and we just had to get our heads around that, which we did nicely, and we played really, really well." Abendanon, who won two caps for England in 2007, also hailed the performance of wing Alivereti Raka, who scored a 25-minute hat-trick and set up another. The Fijian is currently applying for French citizenship, which could see him represent France in the near future. "I'm pretty glad I'm on the same team as him," Abendanon added. "He's a special, special player, who has got everything." 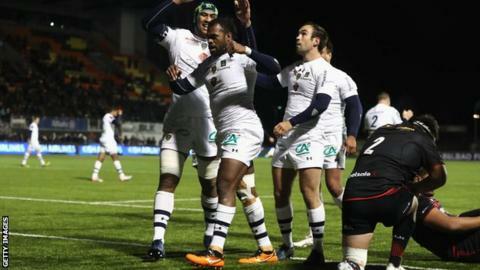 Clermont were inspired by a small but raucous band of their supporters, who braved the Arctic conditions at Allianz Park. "When we came in on the bus, we didn't think any of those supporters would be here, because we were told everyone was taking a flight back," Abendanon said. "When you turn up on the bus and see the supporters waving their flags and banging their drums, it gives you a huge lift."